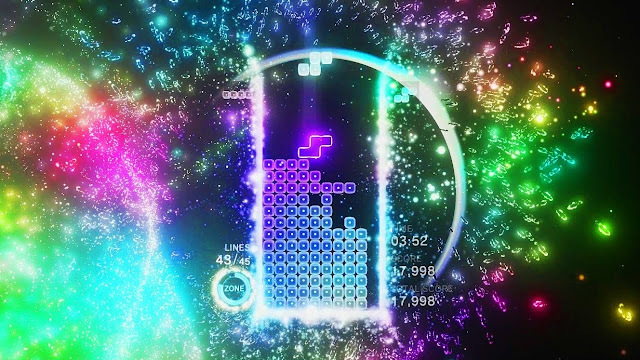 People who love Tetris will love Tetris Effect, because it is Tetris. If I'm stating the obvious, it's only because this game was being pitched on not being a "pure" Tetris, but rather some kind of fusion between Tetris and the neon-and-music genius that made Rez (Tetsuya Mizuguchi). There's a bit of smoke-and-mirrors there, because it's really more a neon-and-music skin of Tetris, with the base game being virtually untouched. Related reading: The other game that nearly perfectly blends light, colour, and music, is Lumines Remastered. Matt's review of the game on Switch. But don't think I'm disappointed. Oh no. Tetris Effect is amazing, and while the promise of a new fusion approach to the gameplay might be a bit of a stretch, the way the game uses music and visuals to subtly adjust your mood and rhythm while playing nonetheless means that Tetris hasn't felt this fresh in quite some time. So, by now you've all played Tetris, so I'm not going to explain how it works yet again (and if you haven't played Tetris, go find a free online clone, give it a whirl, and then drop back in to read the review). Tetris plays just like Tetris in Tetris Effect, with the same goal (get rid of blocks, preferably four rows at a time for those sweet maximum points), and the same fail state (if the blocks reach the top of the screen). 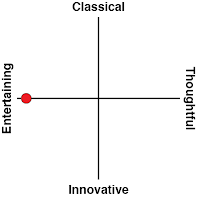 What is different is the musical and environmental elements. As you play, you'll move through a series of environments, each accompanied by rich, encompassing music that shifts between electronica, primal, thumping rhythms, and more experimental ambient tunes. What I quickly found to be the most impressive thing about this game is the way those settings would affect how I played. Regardless of the pace in which the blocks are falling down the screen, which, unlike in standard Tetris, is determined by the rhythm, and therefore will move up and down as the tempo changes - the only concession to the music the gameplay matkes - more tranquil or quiet music would calm me down, I'd find myself moving to specific rhythms for the more primal music, and sweating over the fast stuff. Outside of the main gameplay mode, which I'll get to shortly, this idea of adjusting mood through ambient design is played out in full in the bonus gameplay section, called "Effect Modes." Here there are 15 different ways to play Tetris, categorised into four different themes: "classic", "relax", "focus", and "adventurous." 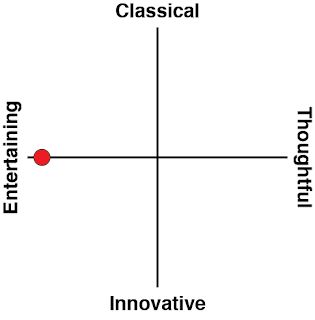 Within these categories, the music will be different, so the "relax" categories features gameplay modes designed to chill out to, and different challenges - the "adventurous" stuff being the most complex form of Tetris with concepts like "dark blocks" and randomised effects (usually negative) while playing. No one's going to enjoy all 15 gameplay modes, but it's impressive how much variety those add to the base game. And, of course, each has a full leaderboard, so you can compare scores, and generally feel terrible that there are so many really good Tetris players out there that you'll just never catch them. I also found that I would indeed gravitate to a particular category to suit my mood in the real world. After a couple of glasses of wine I found myself keen to chill to the "relax" modes, for example, so the developers absolutely hit the brief there. 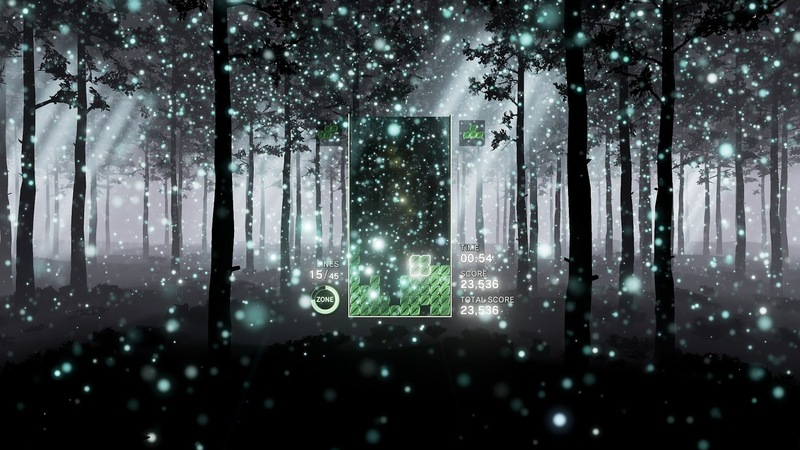 The main gameplay mode, the "Journey" mode, challenges you with a series of multi-stage levels that move you through different moods and environments. To complete the level you need to work through all three, four, or five of the stages within it. The later half of a level becomes incredibly difficult, because by then the blocks have sped up to an almost unmanageable level. On the other hand, it's so easy to lull yourself into a trance-like state while playing Tetris Effect, let the rhythms guide your actions, and the game is well tuned to reward people that can zen-out and take an almost meditative approach to play. It's for this reason that Tetris Effect is one of the best uses of VR that I've come across to date. VR doesn't change the play field, but in wrapping yourself in the vividly colourful environments, and with a good pair of headphones to drown yourself in the music, the game becomes one of those rare examples of something you can simply lose sense of time while playing. This main mode has one additional gameplay trick up its sleeve. As you play you'll slowly build up a meter, which, once filled, gives you access to a "super-mode", where, as you clear blocks, they'll temporary appear on the bottom of the screen. The more blocks you clear the harder this becomes (because the play area gets closer to the top of the screen as the cleared blocks pile up), but when the timer runs out that results in big points. 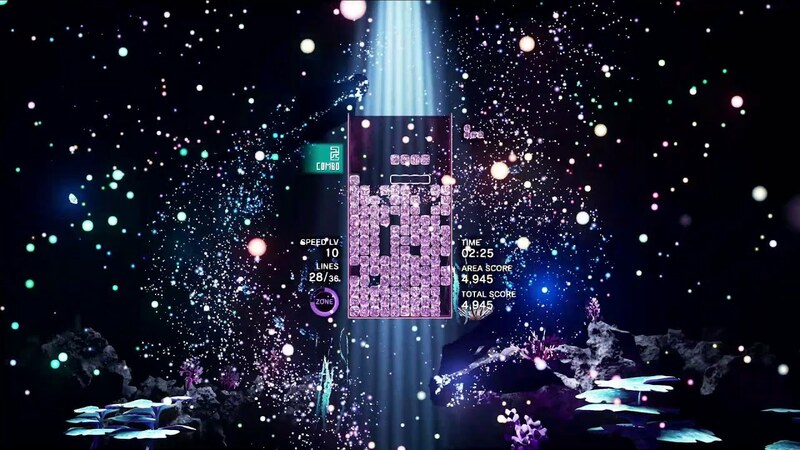 Picking the right time to activate the super, and then clearing the blocks away quickly, is the key to success in Tetris Effect. 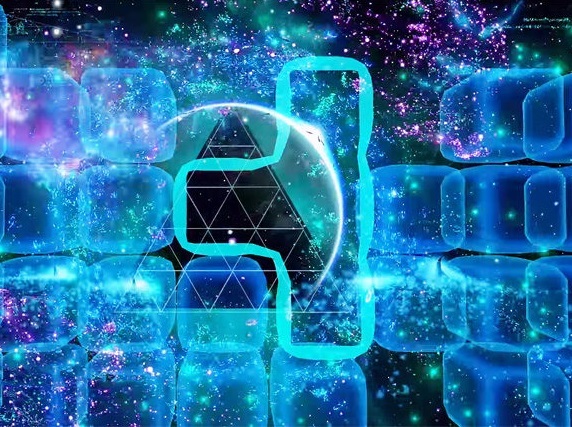 There's no directly competitive multiplayer in Tetris Effect, and many might find that to be an odd omission, since Tetris actually works well as a competitive event. However, Tetris Effect is still highly social. The main menu features images of people's avatars floating around the globe, and there's a constantly updated ranking list of the most popular of the four "categories" that people are playing. Most importantly of all, there's a weekly cooperative mode, where the entire planet has a goal score to reach, with bonus in-game avatars and the like for people who successfully help the group get there. It's easy to imagine that Mizuguchi would have felt direct competition would have ruined the meditative tone he was aiming for with Tetris Effect, so the co-operative and social elements are a nice compromise for people who like to play online, while maintaining Mizuguchi's vision for the game. So Tetris Effect doesn't have the explicit link between music and the puzzle play as something like Lumines does. But at the same time, the audio-visual skins are now superficial; nor do they fail to add anything to the experience. This is a deeply immersive, elegant, intelligent take on Tetris, and the best example of it since the original on Game Boy, all that time ago (and even then, it's mostly nostalgia driving my love of that one).